Theni Kammavar Sangam Matric. Hr. Sec. 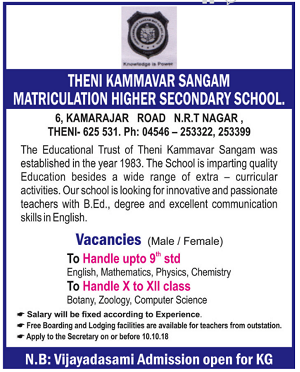 School, Theni has advertised in the DINAMALAR newspaper for the recruitment of Teachers jobs vacancies. Interested and eligible job aspirants are requested to apply immediately from 07th October 2018. Check out further more details below. About School : The Educational Trust of Theni Kammavar Sangam was established in the year 1983. The school is imparting quality education besides a wide range of extra-curricular activities.